There is without question a troubling and growing trend of mass shootings using military-style assault weapons. Do we blame the guns? Do we point to insufficient mental health care? Regardless of your particular stance on gun control, we can all agree that society benefits from a reduction of mass shootings. I have no idea where the idea first germinated, but the Twittersphere has been abuzz of late with the novel suggestion to require liability insurance for gun ownership, in much the same way that automobile owners must carry liability insurance. While such action wouldn't eliminate guns, it would shift the economic costs of misuse from society generally to those most associated with guns. As Cornell economist Robert Franks said in a recent NPR interview, "Nothing in the constitution grants people the right to expose others to serious risk without compensation. Insurance sellers are skillful at estimating the risks posed by drivers with specific characteristics, and we could expect them to be similarly skillful at assessing the risks posed by gun owners." But others are taking a different approach to drive societal change. Plaintiff lawyer Irving Pinsky has floated the idea of a massive lawsuit against the State of Connecticut for the Sandy Hook incident. An interesting twist is that his client is reportedly a child who was not a victim, but a survivor who was traumatized as the events unfolded. According to Pinsky, there are multiple additional parties who could become defendants as more evidence is uncovered. A spokesperson for Connecticut Attorney General George Jepsen responded that such a claim is misguided, and that "...a public policy response by the U.S. Congress and the Connecticut state legislature would be more appropriate than legal action." Other responses to Pinsky's action have been livelier, including multiple death threats and a communication from the state's trial lawyer association scolding Pinsky for the timing of his action. A local newspaper discusses the folly of suing the state rather than Newtown, the municipality which has domain over the implicated school. And the blogosphere and many Facebook walls have exploded with commentary declaring the lawsuit frivolous and equating it with other misguided tort actions - notably the McDonald's hot coffee lawsuit in which a woman received nearly half a million dollars in damages after spilling hot coffee on herself. But as with most issues that engage and enrage the populace, there is more nuance and complexity than meets the eye. In the McDonald's case, the jury was shown evidence that McDonald's had multiple opportunities to address a clear trend of scalding coffee injuring customers, yet business leaders chose, based on micro-economics analysis, to quietly settle cases as they occurred rather than implement a company-wide solution. Similarly, in the early part of this century ample evidence, including statements from Ford engineers, established that the auto manufacturer was explicitly aware that its SUV had a tendency to roll over and kill passengers, yet Ford's leaders chose, based on micro-economics analysis, to quietly settle cases as they occurred rather than implement a company-wide solution. British Petroleum's Deepwater Horizon oil spill into the Gulf of Mexico was reportedly based on a series of cost-cutting decisions and a lack of a system to ensure oil well safety. The space shuttle Challenger disaster shares some of the same characteristics, namely that groupthink decisions coupled with flawed economic analysis tend to underestimate the likelihood and impact of an averse outcome. We've leapt from gun control to hot coffee to astronauts. What, you may ask, is the connection? Simply put, organizations consistently fail to properly predict disasters. Combine the inherent optimism of leaders with a tendency to underestimate financial risk, and most businesses will peg the expected value of an adverse outcome at near zero. (At its core, Expected Value is the probability of an outcome multiplied by its financial impact.) Government, via its regulatory bodies, almost by design enacts rules and guidelines only after a recurring pattern of incidents require it. Note that the transportation, energy and food industries are regulated, yet this failed to prevent the aforementioned incidents. In our legal system, a necessary role of plaintiff lawyers is to identify these gaps, publicize them and, where possible, change the underlying economics of organizations' Expected Value calculations. Consider the optimistic McDonald's executive who calculated the bottom line impact of a few hundred hot coffee lawsuits, each of which might incur a couple thousand dollars in settlements annually, and contrast that with chagrined McDonald's executive who must factor in a $2.8 million punitive damages award on a single hot coffee case (the amount of the original jury award before a judge reduced it), and you can see the impact the plaintiff lawyers have on driving corporate change. Pinksy, in a compelling interview with Bloomberg Law's Lee Pacchia in which they discuss the potential Newtown lawsuit, makes exactly this point: when businesses or government can't or won't act, it's up to plaintiff lawyers to drive change. Of course there are numerous examples of abuse, leading over time to efforts at tort reform - capping punitive damages awards, making it harder to certify a class in a class action lawsuit, etc. I won't pretend to defend frivolous lawsuits, though it's helpful to point out, as this Yale Medical Journal does, that one man's frivolous lawsuit is another man's biased media portrayal. In one of my corporate roles, I ran a company that provided services to plaintiff lawyers, which was quite a change from my many years (before and now) working with mid-size to mega defense law firms and in-house counsel clients. A key takeaway was an appreciation for the voice plaintiff lawyers give to people and issues that otherwise would not reach the light of day. I met numerous plaintiff lawyers who were passionate advocates for the "little people." And, yes, I met some who regarded the little people as mere pawns in an endless quest for ego gratification. But I've met both types on the defense side too. Say what you will about the brash plaintiff lawyers who have stepped up to the microphones after each shooting or other disaster, but I've come to respect the role such lawyers play in our legal system. A topic for endless debate, no doubt, but surely another reason to love this country. For some more fantastic and in-depth back and forth discussion of gun control, see the Becker-Posner blog, where Nobel prize-winning economist Gary Becker and esteemed Federal Judge Richard Posner offer insightful and often opposing perspectives on issues of the day. Even the reader comments are far more educational than any of the pablum put forth on our Facebook walls by self-anointed experts! 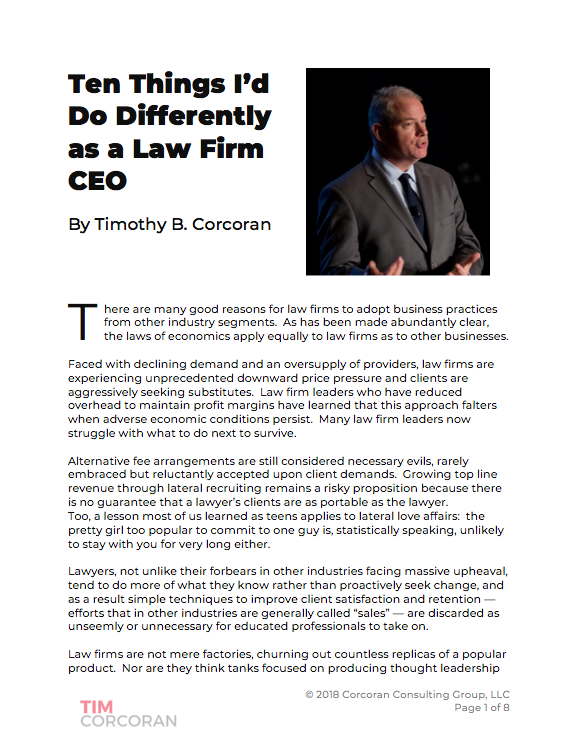 Timothy B. Corcoran delivers keynote presentations and conducts workshops to help lawyers, in-house counsel and legal service providers profit in a time of great change. To inquire about his services, click here or contact him at +1.609.557.7311 or at tim@corcoranconsultinggroup.com.